It was a long, long week at work, so by the time Friday rolled around, I was a sleepy bee. S. was right, though–we had to get on our bikes and head down to the Bike Party, at least for a little bit, to check out the hundreds of people in costumes ready to take over the streets. I couldn’t get it up to put on more than socks and a sweatshirt, but S. donned her cow costume and we zipped down the new door-zone friendly bike lane on St. Paul, collecting other riders as we went before we all made the smart choice to take Maryland Avenue instead. I personally hate riding in big groups, and maybe I’ll get over it one day and embrace the awesomeness. Sigh. The leave-no-man-behind principle is an important and noble one, but I don’t have the patience for it, and it’s hard for me to ride slowly and safely enough to not lock tires with other riders. The whole thing reminds me of the Dyke March in San Francisco–totally wonderful and awesome and fantastic and crowded and slow and shuffling and, well, I like to watch more than do the shuffle-step march for miles. We did a lot of watching as the crowds gathered. There was the pink flamingo worn like Björk’s swan, several Mormons with their perfectly pressed shirts, the Dutch couple, Evil Knievel, Superman, Little Edie, tons of unicorns, and a disturbing number of prisoners (too many people are locked up in this country for that to be cute costume, in my opinion anyway), all milling about waiting for our fearless leaders to set off on the ride. And then they were off, a river of cyclists taking the streets, heeding, at least momentarily, the request to stay to the right. I didn’t have it in me to join them last night, but I’m glad the Bike Party is such a smashing success. Next time, next time, but my ride continued to the bar for food and a payday beer and then back up the hill to home and an early bedtime, like the old lady I sometimes am. 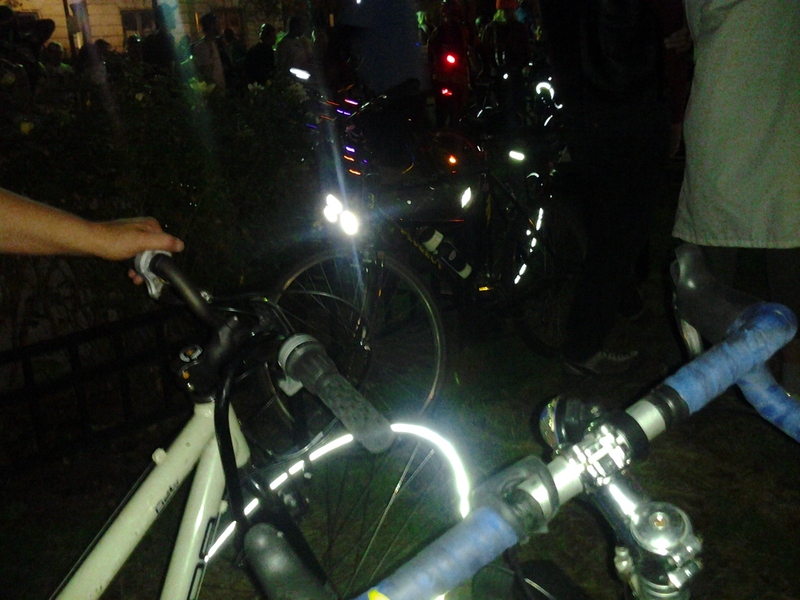 This entry was posted in bikes, crowds, festivals and tagged Baltimore, Bike Party, costumes, Halloween, Mt. Vernon. Bookmark the permalink. I generally go for about half the ride as there are other things to do in the evening. But the energy of 1300 people riding down Lombard Street in costume just made my week.